Hyde Park Progress: Danger: Alderman at Play! Hyde Park has become the Acropolis of the Midwest, home to many abandoned temples. We first chronicled the sad (and continuing) spectacle of the vandalized St. Stephens Church on Blackstone. 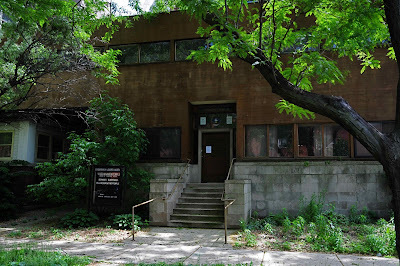 We move on to the abandoned Vivekananada Vedanta Society temple/meeting house in the 5400 block of Hyde Park Boulevard. The Vendata Society is moving into larger and fancier digs outside of Chicago, leaving a vacant and forlorn set of buildings here in HP. The HP headquarters of the VC is fashioned from two large old mansions. The Society, not too keen on design, built an ugly front end that tries to integrate these two structures. To be sure, this addition has probably seen better days as no maintenance or groundskeeping has been done for some time. By now, I'm sure you are asking -- what does this have to do with our 5th ward Alderman, Leslie Hairston? Be patient, let me finish with the "background reading." The two blocks between 53rd and 55th on HPB are lined with 3 story brick condos with a few mid-rises thrown in for good measure. The tree-lined street manages some bucolic character above the roar of CTA buses. The VC property would be the perfect place for an apartment building. The economics of this endeavor probably means an apartment building of more than 3 stories. In swooped the Alderman. 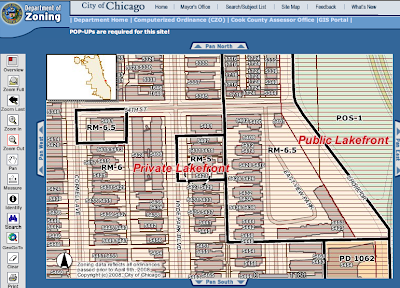 On October 6, 2005, the Alderman sponsored legislation to modify the zoning ordinance to single out this very property and changed the zoning to RM-5 (according to the zoning department website). The black square at the center of this screen shot shows the VC property with the RM 5 designation on it. The zoning arithmetic is complicated, but RM 5 generally means no building to exceed 3.5 to 4 stories. RM 6 allows for mid-rise buildings. You can plainly see that most of east HP is RM 6 (and even RM 6.5) except for the Little House on the Prairie created by Alderman Hairston. It has been rumored elsewhere that the VC is not too happy with this little bit of social engineering as it makes it much more difficult to sell their property. I have no confirmation of this. Is Alderman Hairston wearing her preservation hat or her anti-development corsage? Or is she just looking for leverage? It's hard to tell, but the residents of HP sure deserve some answers. In the end, we are left with yet another eyesore in a prime location. No prospects in sight for development and only continued decline of the property. The best we can hope for in the near term (it's the economy, stupid) is demolition of abandoned buildings. During the year before Alderman Hairston rezoned the VSS property, a developer, L3, had been in negotiation with them, and was also interested in purchasing either or both of the properties to the north and south. L3 was particularly interested in the property to the north, because the VSS property also includes the one-story house with the metal grate on the porch one property to the north. The talks with the people in the property to the north broke down, but we (full disclosure - I live in the property to the south) were still talking to L3 when everybody learned (like, the day before the zoning hearing) that the VSS property was being rezoned to RM5 from RM6. It was a done deal, and L3 immediately lost interest in any of it, so that was the end of that. There was a group of concerned citizens petitioning Alderman Hairston to "do something" to stop any more highrises on HP Blvd., but whether it was that or something else I do not know. I got the impression afterwards that the VSS and L3 simply hadn't been talking to her office about their plans, and it was in response to that. Given the recent flap about the bus stop on 57th St., I'm more inclined to believe the latter. But wasn't -most- of E. HP in Alderman Hairston's district recently rezoned to RM5? What's with that? thanks! I've heard that rumor about rezoning a lot of EHP as well, but am unable to confirm it. Perhaps, we can invite Alderman Hairston to write a guest post and explain all of this and how it's going to help folks in EHP. She has a lot of explaining to do! If this is true -- and I'd be interested to know -- then it resembles a recent case in Wicker Park/Bucktown of a non-profit moving out of a neighborhood and taking advantage of an appreciation in the value of its property to expand and continue its mission elsewhere. I'm thinking of Association House -- the historic settlement society that inhabited the historic prairie schoold building in the 2100 block of W. North Avenue for 100 years, before selling the property to a developer in (I think) 2006. At issue there, was a playground -- said to be the oldest in Chicago -- that had been used by generations of immigrant children, but had seen less and less activity as the organization's clientele moved further west and the number of children in the neighborhood declined. Local folks lobbied to keep the playground as open space, and lost. Had they succeeded, they would have deprived Association House of several million dollars worth of income from the sale of the consolidated property. In that case, preservation (for whom? for what?) clearly went up against an established non-profit community outreach group with a long record of service, that needed money to expand, and wanted to get it by selling its assets. Slightly off topic, but the cover story of the latest Weekly Standard is about Hyde Park, and it is wide ranging. Even some of the usual suspects get named. I really wonder, if a brother from the neighborhood weren't running for president, would so many Hyde Parkers would be forwarding a link to Bill Kristol's little neocon mag? Or does l'esprit de clocher trump ideology? Sleepy little Hyde Park's time in the sun? But I love the line about HP being a place that's rootless and has had its soul ripped out. So much for "community." Or, maybe that's exactly the "why" of "community". Obama's just the latest drifter to plow a few acres and call it home. What sun do you speak of, with all of the parakeet nests blotting out the warming glow of the sun. No mention of our charming carrier parakeets in the article. And not a peep about the killer logs of the METRA viaduct. I'd definitely like to see a blog about the HP piece. In some ways they got it right, others terribly wrong - provocative all the same. But I love the line about HP being a place that's rootless and has had its soul ripped out. So much for "community." Or, maybe that's exactly the "why" of "community". It’s sort of interesting to speculate just how much of the sentimental old-timer crowd profited directly from urban renewal (like buying pretty nice single family homes cheap in developments that replaced apartment blocks, for example, and then watching them just appreciate and appreciate solidly ever since) and have a psychological need to believe that ruthlessly displacing all those poor people was in a “good cause,” our wonderful community of Hyde Park. If Hyde Park were allowed to ultimately become just like Bucktown or whatever, then urban renewal would turn out really to have just been another word for plain old gentrification. In 1953, after a two-year rise from copyboy to overnight editor of Chicago's hardboiled, fast-moving City News Bureau, brash, blond Bruce Sagan (rhymes with pagan) paid $2,500 for a withered weekly called the Hyde Park Herald. Breathing life into the body and new fire into the Southside community. Publisher Sagant [sic] mounted a hard-hitting campaign for slum clearance, coupled picture spreads of slum dwellings (including owners' names) with authoritative how-to-do-it articles on redevelopment. Outcome: Hyde Park qualified for federal aid as the Midwest's first and biggest project of this type approved under the new Eisenhower urban-renewal program. Of course a lot of people who participated in or profited from urban renewal are instead dealing with their apparent sense of guilt by pretending that the University imposed it on everyone against their will and it had nothing at all to do with them, so possibly my speculation is off-base. My word! Out comes my copy of "Seedless." 2. Loss of privacy all year 'round, and increased noise during "open window" season, since the distance from our windows to those of any structure of more than four stories on that plot of land would be extremely short. The sounds of TVs and barking dogs and rehearsing musicians and bawling children would carry readily to our units. 3. Diminished resale values: buyers are eager to acquire properties with beautiful views and are willing to pay for them. The impact would be significant, since the appeal of a full-on view of someone else's window 30 or 40 yards away, and nothing else, is real close to zero. 4. Other adjacent buildings besides ours, such as those across the street that would be shadowed by a building of the proposed stature, would be variously negatively affected. 5. In order to make a big enough footprint, the developers in question (L3) would have to have acquired at least one more building along that stretch. Among others, they approached people in 5415 S. Hyde Park (a six flat, I believe) to determine their willingness to sell out. In other words, a high rise building there would be enormous and have all kinds of impacts on a large number of neighbors, not just people living at 5401 S. Hyde Park. The above consequences aside, were another tall building to arise elsewhere on the block, farther from my home, I would still object. If I wanted to live in such a setting, I would move north, say, to the intersection of Sheridan and Hollywood. There are other high rises now scattered through the area, and we're gaining at least two more in the foreseeable future (Cornell and 53rd, Cornell and 56th). If this trend continues, the quality of life on our relatively low-density, beautifully green urban block would deteriorate significantly. All of the above is, of course, in addition, to the usual concerns about increased auto traffic and parking pressures that high density brings. As noted, the Vivekananda property is a growing eyesore, but the solution is not to erect a 10-plus story building. I know I speak for many of my neighbors when I say we would greatly welcome new townhouses or a single family homes, recognizing that neither would be as profitable as a high rise. But let's please replace our liability with something that will enhance our neighborhood, not with a disastrous 900-pound gorilla that would provide no benefit to any of us. I understand Veronica's concerns, but to me that is the exactly the area of the neighborhood that should see higher density uses. It's got great public transit access and it's close to the lake, so property values will naturally be higher. I'm guessing that developers would not find single-family homes profitable in that location. I can only imagine what the property taxes would be. To make that space attractive to a developer, I believe at least a moderate density building will be required. Short of that, the building will continue to deteriorate. Full disclosure--I live in northwest Hyde Park, so I guess I'm not qualified to weigh in on this, but I support more density in all parts of the neighborhood, including my own. Speaking of 900 pound gorillas, HPP has made the news again--see today's Tribune Metro section article on the sculpture/roadblock. Veronica - isn't 5401 the high rise on the SE corner of 54th and H. Park Blvd.? Are you suggesting you "own" the view to the south of your building? She wants to make it clear she is not a NIMBY, she is a NIABY - not in anybody's back yard. Seriously, the comment so nice she had to say it twice is basically ripped from the NIMBY handbook. It sounds like a Herald letter. Let's see, parking and traffic issues, check! Dire, the sky is falling tone, check! "Quality of life" issues, check! Claims to rights that don't belong to her, check! Seriously, if you want high rises move north. If you want to live in a nice area with no traffic, no sounds of T.V.s, musicians, and "bawling children" and a beautiful view of the lake try Michigan or Wisconsin. Do not live within the city limits of the 3rd biggest city in the U.S.! The sounds of TVs and barking dogs and rehearsing musicians and bawling children would carry readily to our units. What a neighborly sentiment. Just when I think maybe things have gotten a little less NIMBY-ish and blatantly self-serving, stuff like this shows up. Quality of life? Obviously doesn't include babies, dogs, and musicians. We'll move out tomorrow, no problem! Not surprisingly, this argument comes with all the usual unsubstantiated claims about increased auto traffic and parking pressures that high density brings, and the more hysterical and even less substantiated claims of diminished resale values. All of which convinces me that the anti-NIMBY jihad must continue. If there were any data supporting this kind of NIMBY claim, it shouldn't be too hard to collect, given that in the South Loop high rises have sprouted up one in front of the other and if there were any correlation of this sort, it should be demonstrable. Thanks to Veronica for her comments about the zoning in the area. I think it's important to hear all views on this issue. It puzzles me that you would prefer an empty building next door that will likely deteriorate and could start to create problems that will hurt property values. It's clear that the current zoning is not helping development at all. We all take risks when we buy real estate, and neighboring builidings changing is one of them. There's a balance that needs to be struck here. I'm reminded of when my brother bought a house out in the suburbs in a new subdivision. HE became anti-development because he didn't move to that location so that other people could buy houses in wha were cornfields when he moved out there. All THOSE people did was bring more traffic and ruin the ambiance he and his family sought by moving there. Whose rights are more important? Do we have an expectation of no change? Even if it costs a neighbor their right to try make a fair return on their investment? Or even the ability to sell a property? What is the cost to the neighborhood if we constantly try to maintain simply what is ours? Are we losing the dynamism that will make the neighborhood really attractive? I guess I understand your views, but, ultiamtely, I think trying to keep things the way they are with an empty building nex door is worse for property values and the neighborhood. there are other scenarios to consider besides the doom and gloom recent posts associate with development. Things could work out a little differently - higher density in fact leads to reduced automobile trips, property values in fact might be enhanced by a high rise with amenities - certainly more than the deteriorating eyesore or a vacant lot. Greater density strengthens Hyde Park's market and will help attract retailers, etc...to Hyde Park. Would you simply like Hyde Park to remain the same forever? Have you seen some of the characterizations of HP in recent press that describes the subsistence retail here? Here is a comment that is actually verifiable. There have been high-rises here since the 1920s and the invention of the steel-framed building. we're gaining at least two more in the foreseeable future (Cornell and 53rd, Cornell and 56th). If this trend continues, the quality of life on our relatively low-density, beautifully green urban block would deteriorate significantly. Again, subjective measures, no comparables, and the confusion of short-term trends with long-term ones. Subjective measures: It has already been made clear by the commentator that the "quality of life" at issue here is rather precariously based on subjective dislike for things like children or dogs, etc. I'd think twice about moving in next door to people with these attitudes, and if that doesn't help to drop resale values, I don't know what does. Comparables: as another commentator has pointed out, the correlation between density and property values is actually a positive and demonstrable one, which triggers all sorts of secondary effects of the sort we discus on this blog, such as the establishment of local mass and niche market retail, higher rates of transit usage, and better and safer street life. THOSE things all demonstrably correlate with higher property values. You can get a great "view shed" (??) in Montana outside Glacier National Park. But a lot of factors will make people want to live in Hyde Park, Chicago, whether they have access to that awesome (public domain) "view shed" or not. Confusion of trends: as a few other commentators have pointed out, the problem is not that Hyde Park is gaining density, has too much congestion, or that Ms. Wald hears too much noise. The problems have all been, as we've been saying for almost a year now on this blog, just the opposite. In fact, the long term trend, the real one that underlies the local economy and affects all of us in terms of being able to shop close to home, have streets that are inviting and safe after dark, save money on gasoline and the household transportation budget, involves making Hyde Park MORE dense than it already is, which means getting it closer (though not completely) to what it WAS back in the 1950s and early 1960s and before. That is the mean towards which HP will revert, the long term trend that you can't dismiss unless you tear down Chicago and rebuild it as a suburb. The in-fill trends and urban reinvestment trends that have occurred in other Chicago neighborhoods and other cities will come to HP and the South Side eventually, because the infrastructure is here to hold the kinds of load that used to be here; some people may like the "feel" of disinvestment, isolation, relatively easy free parking on the street, and good deals on cheap condos that you could never get on the North Side, but these things are all a function of the economic malaise of a huge section of the City of Chicago. Spurious assertions about property values aside, if an HP resident thinks trends are worth paying attention to, and that they impinge on a conception of "quality of life," then that resident should think long and hard about their choice of location. Because the trend towards increasing density in central urban areas is a powerful and documented one, one that is going to continue, with all the barking dogs, crying babies, and neighbors trying to steal your free street parking. David Farley has the good sense to ask, above, isn't 5401 the highrise on the SE corner of 54th and H. Park Blvd.? Are you suggesting you "own" the view to the south of your building? Ms. Veronica Ward, claimant to an endangered "view shed" to which she has no legal right, resides by her own disclosure in a 15-story building - technically a high-rise -- 151 ft tall, a nice concrete box built in 1962 that is as much of a 900 lb gorilla as anything that's likely to get built nearby. So let's get this straight. Veronica Ward is happy to live in her high-rise. But she doesn't want anyone else to have one, because, well, she got there first and wants to keep it that way. Not quite the picture of "grandma-in-the-rundown-Victorian-brownstone" that might get more sympathy. This is about as clear a case of I've got mine now you stay out that I can think of. My girlfriend lives in one of the older high-rise condo buildings in the South Loop (built in the early 1980s). Her property value has increased massively over the past 8 years and, in fact, the South Loop is one of the few areas of the city that has managed to HOLD its property values during the recent housing/subprime loan crisis. I wanted to comment on this too. I'm not an expert so I don't know what the threshold is for a mid-ride building vs a high-rise building, but that block alone has three buildings that I would consider high-rise. Veronica's building, The Mayfair (where I lived quite happily for 4 years), and the much much taller condo building in the middle of the block (that I don't know the name of). I'm glad we're discussing density and bringing people to Hyde Park for shopping, etc. At one time, Hyde Park WAS a destination. Currently, we have one really crappy hotel in HP, but at one time (1920s until the 1960s or 1970s) we had MANY hotels. The Mayfair was a hotel at one time. The sadly neglected Del Prado building used to be a very upscale hotel. Several other buildings in that 4 or 5 block radius were hotels and there are one or two that have since been torn down. Think of all the money those people spent in the local economy! Hyde Park needs to become a destination for SOMETHING again, and we need hotels. And now, we can't even tear down an abandoned, crumbling hospital to build a NEW hotel to bring people in to buy lunch at Salonica, books at O'Gara and Wilson, enjoy Jackson Park, etc. Doesn't Veronica realize that any loss of property value in her high-rise condo building due to the construction of a new building a spot or two down (questionable) would be offset by the benefit to the local ecoonomy? As the South Loop shows us, more people means more goods and services available. 10-15 years ago, the South Loop was a scary wasteland of burned out warehouses and fleabag transient hotels with hourly rates. Look at it now. Apparently, my wife and I have ruined the property value of our building and the buildings immediately adjacent our own. You see, we had a baby last July, and sometimes he cries. He cries when he's hungry; he cries when he bumps his head; and he cries when he just wants to be held. Sometimes he cries in the middle of the night. We also open our windows, so our little son's cries escape our humble unit and finds their way into other people's units. What crappy quality of life for our neighbors. Perhaps Veronica could tell us where she would like us to live, so we don't bother all our neighbors. We really feel bad - I guess "there goes the neighborhood" really applied when we moved in. Sorry, but Veronica's comments were downright insulting. Why live in a city, Veronica? Were you a fan of restrictive covenants as well? I have to admit I haven't thought much about all this (even though I live right beside the place) until this discussion erupted here. To be honest, it was an ordeal I would not like to go through again, and it does not seem like I will have to. 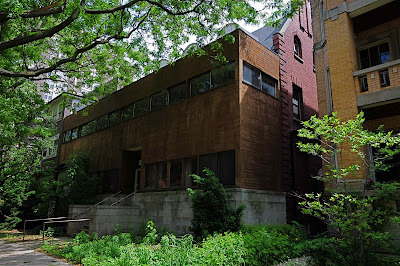 There's not much, if any, acknowledgement from the parties involved in pushing the rezoning through, or from Alderman Hairston herself, that by selectively rezoning to protect the purported value of other properties in the neighborhood, real damage was done to the value of the Vivekananda property. How do they get redress for that loss? Oh, they don't - too bad. As I recall, L3 was in talks with the Vivekananda people for over a year, and maybe with us and the 5415 people for at least a good chunk of a year (to be honest, it is not a process I would like to repeat) and there is no way, in my opinion, that Alderman Hairston was not aware of what was going on. At the least, there should have been some dialog between all interested parties before the rezoning, and that dialog was not the rushed-through rezoning hearing. I'm not even sure the Vivekananda people (or us) were notified of the rezoning - the info may have come from L3. I only remember being told about it from someone else in the building, and since I was out of town, couldn't attend the hearing (which was a foregone conclusion). The cynical answer will be, that's how things are done in Chicago. I'm of the opinion that the Alderman's office didn't pay much attention to the whole affair or didn't care until Veronica Wald & Co. pushed the panic button and set off this emergency last-minute, sort-of-secret rezoning to prevent Something Awful from happening. But why? As others have noted, East Hyde Park is a mix of houses, low-rises, mid-rises, and high-rises, and the mid and high-rise buildings were built at different times. Can someone explain what has changed since the last high-rise went up that calls for draconian and selective rezoning? Should Alderman Hairston declare a high-rise abatement program and we could start getting rid of some of the existing ones that are probably driving down my property values and taking my rightful parking places? In fact, I think all buildings newer than my building (1918 or thereabouts) in E. Hyde Park should be removed and replaced with things I like - my building was here first. Swami Vivekananda seems like a pretty cool guy, by the way. My many personal deficiencies and gross selfishness aside, I see that there are two issues here. The first, and probably easiest to solve, is what to do with a neglected and kind of ugly space in our midst, and the second, and farther-reaching, is how to improve quality of life (oh, there it is again) for the maximum number of local residents without great negative impacts. Putting a large building in the spot vacated by the Vivekananda sect will certainly change the eyesore, though who knows what the aesthetics of its replacement might be. But even if the building is breathtakingly gorgeous, it will not represent an improvement for most of us who live close by (except those eager to sell their homes to a developer and those able to rent parking spaces in its garage, that is, a small minority), and it is not at all clear that it’s the best (or even a good) solution for any of various other ills affecting people living in other corners of Hyde Park. I also thought it important to rebut the sentiment that one day our alderman lost her mind and without constituent input spontaneously down-zoned Vivekananda site. She was, in fact, very much responding to the most directly-affected component of her voting public. Yes, that abandoned temple is a mess that I walk past and rue several times a day. And, Hyde Park needs a variety of rental apartments not owned and managed by MAC Properties (not clear that we need more condos, however, e.g., Silver Cloud units, a block-and-a-half away, aren't exactly selling like hotcakes). Plus we sure could use much more and better quality retail and commercial development, which I trust no one is suggesting for that location. But come to think of it, something low-rise and appropriate for the Hyde Park market could be a fabulous, and maybe even profitable, asset. In any case, aren’t there other ways to achieve these ends besides putting up a big residential structure in an already well-packed side of Hyde Park? How about addressing the demand for decent rentals by erecting a multi-unit structure, say, along Cottage Grove, where there is access to the CTA, the Dan Ryan, U of C and Lutheran Seminary campuses, and lovely Washington Park? Plus, over there, the view sheds (use your imagination) of only a very few residents would be disrupted. For the record, I have a great deal more invested in Hyde Park than my measly life-savings in a little condo with nice sky and air around it; I have lived and worked here for 40 years. Nonetheless, my entrenchment does not cause me to oppose change that benefits the wider community, including my self-interested self (case in point: I longed for the swift death of the dysfunctional Co-op and am thrilled with the brilliant, though expensive, Treasure Island). The implication that I’m a hypocrite because I live in a high rise is spurious since the building has been on that spot since 1964 and I would bet that nearly everyone who lives around it elected to move there after 5401 was built. In other words, my moving closer to the ground wouldn’t solve the burning problem of people in the Hedgerow not having a lake view. Two more personal comments, then I will shut up and go away. The idea that I “own” that view was perfectly stated, and I did pay for it. The difference between what I sold my otherwise identical non-view unit in that building for and what I paid for my current unit might reasonably be said to be the cost of the view. Nonetheless, mine is not exclusive ownership; in 5401 alone there are 35 units that face south. So perhaps you could say that I paid for something like 1/35th of that view, as did 34 other neighbors. And as to the most welcome suggestion that I move to Montana, rest assured, last month I spent several days with a Bozeman realtor, that is indeed my ultimate plan (as Peter Rossi knows). But until that can happen for me personally, may I suggest that those who find so much value in high density urban living and genuinely love closely-spaced large structures, lack of privacy, and having their sleep interrupted by neighborly noises simply move to Hollywood and Sheridan? Veronica, sorry to inform you but there have been numerous cases on the issue of "who owns the view". You aren't the first one to complain about your "right" to sunlight and unobstructed view (although maybe you're the first to complain about hypothetical babies). Unfortunately, the law is unequivocally and absolutely against you. You have absolutely no property right in your view. Maybe you paid more because at the time you liked the view, but as has been stated previously, the risk is always that you will lose it. So now it is either your way or Hollywood and Sheridan, huh? Interesting. Thanks to Veronica for responding to the voluminous comments. I want to respond to your comment about your owning the view. You may have bought a unit that has a view at this point in time, but I don't think your ownership rights extend outward from the boundaries of your unit. Air rights exist in the vertical plane, not the horizontal. As far as I know, there is no specific right to a view. You may think you bought the view in perpetuity, but your rights extend only as far as the law keeps the viewshed open. It's a risk associated with the purchase of real estate. Ultimately, it is self-defeating for a neighborhood to mandate that things stay the same. Since it's come up twice ... Hollywood & Sheridan sounds like the armpit of the world, and where all Hyde Park wrong-thinkers must move. Isn't the problem there not the high-rises stuffed with noisemakers but the fact that it's a traffic choke point where Lake Shore Drive abruptly ends? Let's cut to the chase here, because this is the issue driving everything and that comes up again and again. Here's the skinny. There is no law protecting lake views. You don't have a right to it in either legal or economic terms, and ethically it does indeed come across as hypocritical for one high-rise dweller to forbid a hypothetical second high-rise because it would disturb the status quo. Unless you live right on the Lake, you could quite legally lose your lake view tomorrow. If we want to talk economics, then as with all real estate, one's lake view is an investment that has risks that will play out on the open market. Theoretically, if markets are efficient, then the risk of a building going up on the private property a few lots down, thereby blocking your view, has already been factored into its selling price, which is lower than it would otherwise be if the view was guaranteed. So, in fact, the person with a lake view in 5401 S. HP Boulevard got a deal, and if it's eventually blocked, then they got what they paid for. But again, there is still no evidence being offered as to any of the negative impacts Ms. Wald is forecasting, so even the little bit of microeconomics above will have to remain speculative. But the purchaser of a lake-view property also accepted a risk, presumably built into the price, that that view could change. The question is, should that person be able to act politically to lessen the negative market impact (and there is still no evidence that this exists unless you use your imagination) based on unsubstantiated assertions about property values and urban dynamics, in such a way that deprives the seller of potential revenue, and lowers the attractiveness of the remaining lot? Until we see some data backing up the "I got here first" lake-view arguments against a nearby high-rise, unfortunately we have no other choice but to use our imagination, which may satisfy certain Aldermen, and may succeed in getting people riled up, which is what imagination is good for, but which I would argue is not a good basis for public policy or for setting a long-term vision for neighborhood improvement. I do not see therelevance of Cottage GRove to this discussion. I found your referance to my friends and neighbors that live near Cottage Grove as "over there", rather condescending - but perhpas that was not your intention. By decent, do you mean affordable? The cost of the HP Blvd propertynd is valued at a price that makes it very difficult for someone to build in today's market, a 3 - 4 story building. The high-rise that you live in has helped to create that value. Silver Cloud is not selling and I don't see shovels at 53rd & Cornell either - which is now going to be a 21 story RENTAL building. So, I think your will have your view of a deteriorating eyesore for a long time. The term "viewshed" was a new one to me, so I looked it up. If the wikipedia definition is to be trusted, it does not seem to apply to this situation, unless you disregard everything after the first sentence. "A viewshed is an area of land, water, and other environmental elements that is visible from a fixed vantage point. The term is used widely in such areas as urban planning, archaeology, and military science. In urban planning, for example, viewsheds tend to be areas of particular scenic or historic value that are deemed worthy of preservation against development or other change. Viewsheds are often spaces that are readily visible from public areas such as from public roadways or public parks. The preservation of viewsheds is frequently a goal in the designation of open space areas, green belts, and community separators." Wow, I did not know that we live "over there" (near Cottage Grove). From a home owners perspective, "over there" is great. Everyone should visit. And for the record, we welcome development with open arms, over here. The views go on for miles. The question whether this refers to the Hyde Park Arms or the Ramada is perhaps telling. Ramakrishna, on the other hand, who is pretty much the point of the whole operation, was known for a level of general distraction that involved a lot of hash and his diaper often falling off. Theoretically, if markets are efficient, then the risk of a building going up on the private property a few lots down, thereby blocking your view, has already been factored into its selling price, which is lower than it would otherwise be if the view was guaranteed. As a side note, this statement would make a great deal more sense if "efficient" were replaced by "frictionless." Markets are temporal in nature, and fortune tellers are everywhere in short supply.